French Dip Reviews: 3 of 5 DeliciScore™ (Good) Awarded to Tub's Gourmet Subs for their French Dip Sandwich in Lynnwood, WA on this 30th day of October, 2016 - A true classic. 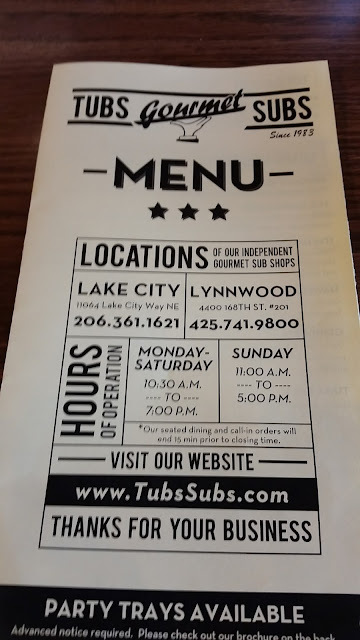 3 of 5 DeliciScore™ (Good) Awarded to Tub's Gourmet Subs for their French Dip Sandwich in Lynnwood, WA on this 30th day of October, 2016 - A true classic. 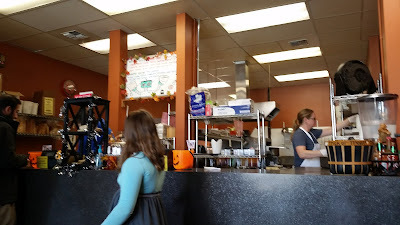 I was out shopping for a new (used) car with my brother and we found ourselves at Tub's Gourmet Sandwiches in Lynwood at lunchtime. 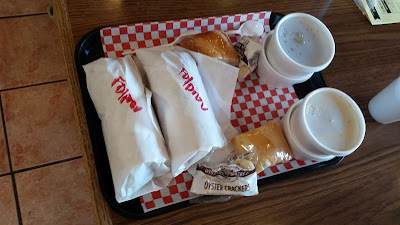 I had been to Tub's before, even reviewed one of their sandwiches, the Firecracker, which was so delicious. 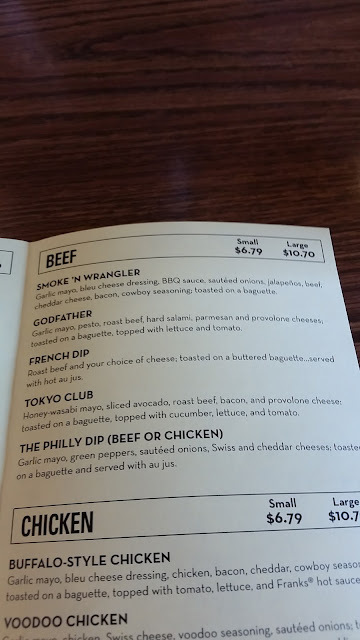 I was excited to have their French dip. I felt deplete to have not had it before. 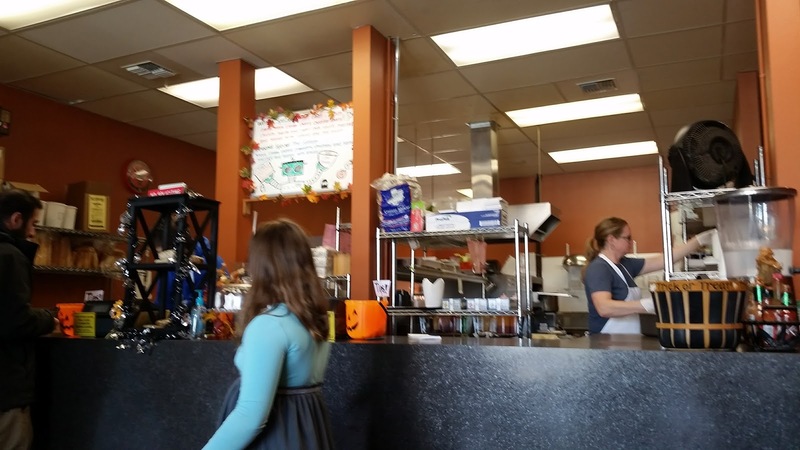 Tub's is a deli-style establishment that feels pretty ma and pa, local, which is good. It has a good feeling and vibe and I believe it has a pretty good following, large clientele, and respected brand. 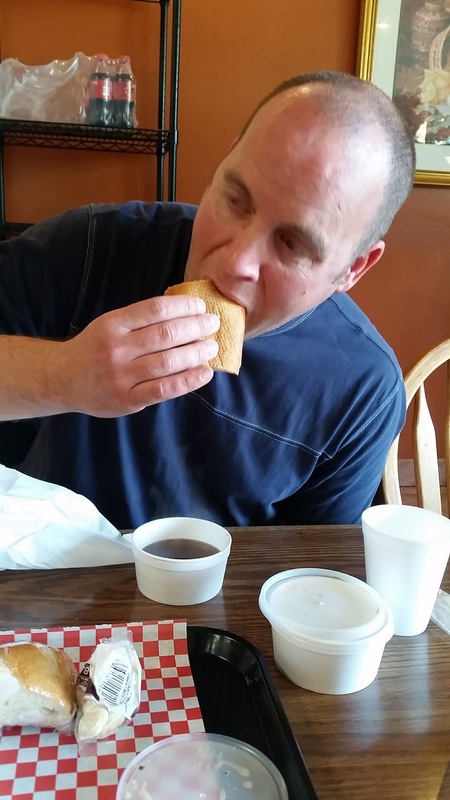 Adam and I both ordered the French dip (small size). "Roast beef and your choice of cheese, toasted on a buttered baguette...served with hot au jus." Sounds simple and about right. We both opted for provolone over the other selections of cheddar and Swiss. In hindsight, one of those other cheeses, could have made the sandwich a bit more interesting. When we were ordering, the kid at the counter told us that I was the third "Eric" (spellings varied) to order in a row. I forgot this fact and while drinking our waters, waiting for our order, I heard "Eric" called out. So I rushed to the counter and reviewed the order. I quickly realized it was not mine but was also reminded of just how delicious the Firecracker sandwich was. The other Eric agreed that the Firecracker was awesome. We continued waiting...not too long...and eventually got our order that included sides of clam chowder. 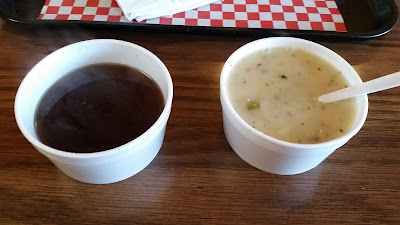 Note that the chowder is served with a piece of bread as a side, which seems a bit strange (carb heavy) especially within the context of a sandwich. Here is my jus and chowder. Both in styrofoam. LOTS of styrofoam was used in the delivery of this meal, which seems a bit sad to me. I would think they would get with the clue on that issue by now. Switching to another packing type would have many benefits to their brand. 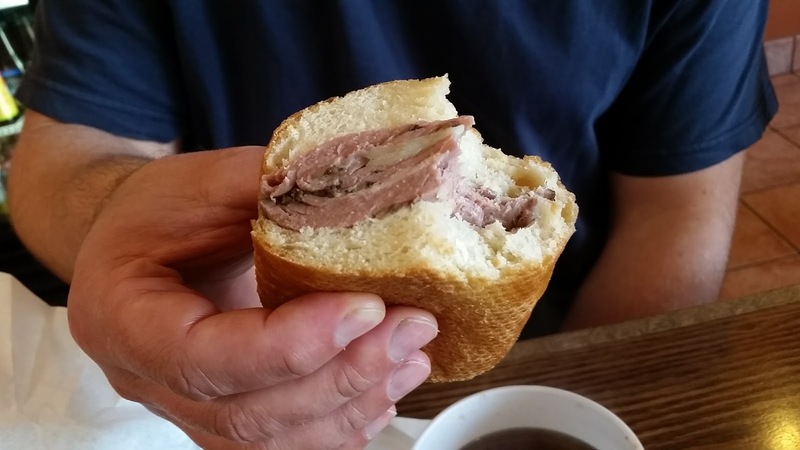 Here's the French dip sandwich. You can see quite a bit of roast beef and good, nice quality bread. It was toasted nicely as well. Here's my hand-model, Adam, after his first bite. Note that I instructed him to eat the sandwich first, alone, to judge its utility. Good not great chowder with black peppery taste, thin texture. The bread was perfectly toasted and good. The overall size was generous. The use of so much styrofoam was a bit over the top and ridiculous. This might fly in Texas but I would think Washingtonians are a bit more conscious / concerned about this issue. Lots of roast beef piled high but it was not HOT, which made the sandwich lose points. The sandwich was good-tasting when enjoyed by itself sans jus. I chose provolone cheese which was an okay choice but didn't add a lot. 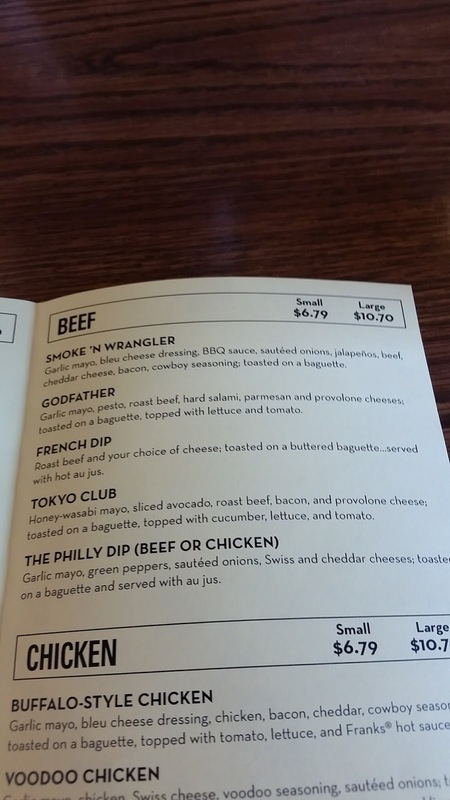 I may prefer Swiss cheese for a French dip due to its deep, umami flavor. The bread was very absorbent, which took up a lot of jus, causing me to re-order jus. I watched the lady pour me a new jus out of a coffee thermos, which did not heighten the degree of perceived flavor for me. 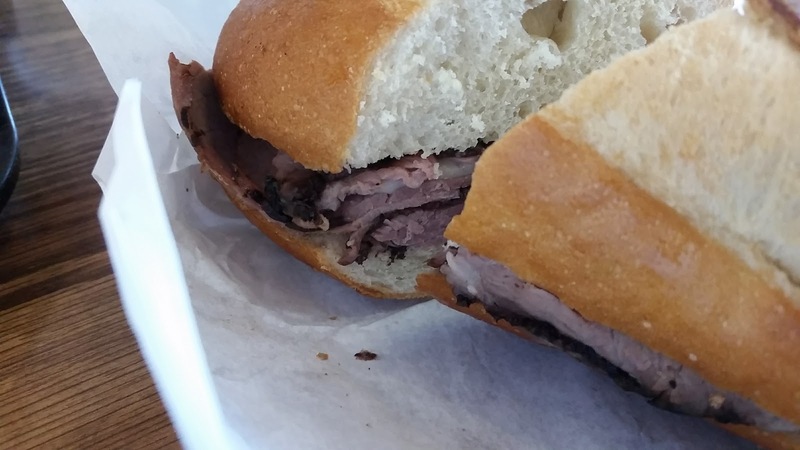 The roast beef on the sandwich was plentiful and fine-tasting but cold. Lost points here. The bread was indeed buttered and the $6.79 price tag was reasonable. Overall this was a 3.5 of 5 ("pretty good"), simple, no frills except cheese. A competent and reasonable sandwich. Bread 3 of 5 - Too absorbent, perhaps too much. Jus 3 of 5 - OK only but served hot, which was nice. Meat - 2.5 of 5 - Fine roast beef but it was served cold, which I don't really like as a contrast to the hot jus. 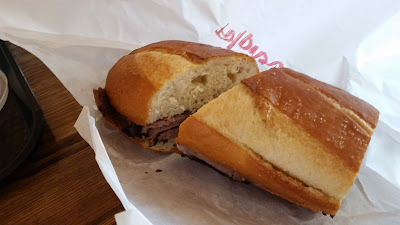 Tubs is a good sandwich shop and makes a good, solid French dip that could be improved by eco-friendly packaging, hotter (jus-dipped) roast beef, and richer jus.